Shortsword modification adds four blade, each of which is endowed with ability. First you need to create an enchantment table and workpiece of sword. Then find one of the four elements of the sword: slime, nether brick, diamond or coal. Place the workpiece on the table and insert element. Sword absorb the aura of nature. Done! [Fire sword] The enemy will be set on fire during the attack. Sword spew a fireball. [Poison sword] Sword will poison your opponent. [Frost sword] When you click on the block will create icy thorn. It allows you to build a fortress in haste. [Darkness sword] When attacking an enemy get draining. When you click on the block sword will spawn allied bat. 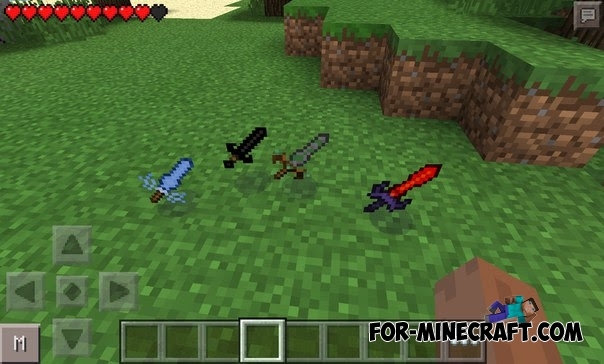 Lime Sword Mod for Minecraft PE 0.11.1Install this cool mod and your inventory will be replenished with new interesting and beautiful lime sword! 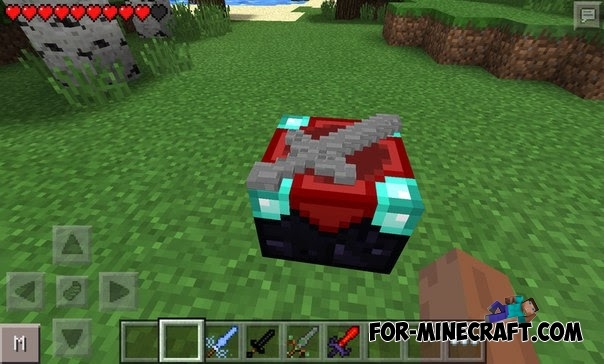 Infinity Sword mod for MCPE 0.10.5With this mod you will get just simply one thing. This is a very sharp sword.